The photo above is what 19,000 people packed into a basketball arena to hear Vermont socialist/independent Sen. Bernie Sanders looks like. What you don't see are the 9,000 other people who couldn't get into the arena but listened on loudspeakers outside. 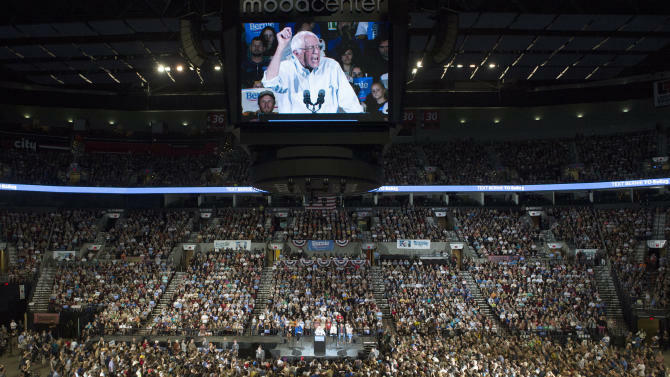 That was the crowd that gathered on Sunday in Portland, Ore., to hear Sanders speak -- the largest gathering of a presidential bid that has made its name on its big crowds. "Portland, you have done it better than anyone else," Sanders said at the speech of his one-hour (!) speech, according to the Oregonian. 28,000 in Portland - 20,000 in the stadium - 8,000 outside. And yet when HRC draws 1,000s and 1,000s LESS - MSM and all of the squawking head pundits still refer to her as the democratic front runner. UnF'n believable - Bernie's got the support but MSM won't recognize the truth. 27,000 in LA and yet the squawking heads of MSM still call HRC the frontrunner - what crowds is she gathering? The people don't want another elitist in office. This is gonna be an interesting couple of years. I hear the Hillary camp is releasing "opposition stuff" on Bernie, the media talks about trump all day, Bernie is polling just as high and drawing crowds four times as big as their biggest, I hear it mentioned once and a while but never his message and they never connect the two, I am hopeful but I have been through this before we could have elected Gore when the world approaching the climate crisis now I don't see any way we avoid disaster of course solar is coming on fast so it is a race. Gotta get past the silence of MSM. Yeah - "it's ALL" - about HRC. Roll with a corporate party and get corporate solutions. Its not a hard paradigm to figure, you just have to remove your ingrained emotions and think. They were just talking about how Jeb! drawing 150 in New Hampshire would be pretty good ig Trump weren't down the street pulling in 1200, but they never talk about Bernie when he is pulling tens of thousands it is crap but it will not hold if the people maintain their pressure and insist that Bernie be listened to. The employers of the scripted MSM squawking heads - are praying that Bernie will just go away - and are doing their best to belittle him. Trump is the horrific bloody train wreck - everyone is drawn to look - they know it is ugly - but they just gotta look. Sounds like trump's crowds are white supremacists. Yeah what a following - insane haters - there is a real claim to fame. Something really stinks about ones party if it's haters they attract. isn't the election about issues ? Don't ask me - Ask the MSM ! and - BTW - Bernie has a very complete and strong platform. Apparently you are not aware. why doesn't he promote any issues ? Why don't you try out that new thing called Google? Apparently - You - yes - YOU - need to get your hearing checked as well as your eye sight - so that you will be able to hear and see and understand what you may hear and or see - if you ever do an on-line search for coverage of what Bernie has been saying "quite extensively" for a very long time. Demanding that the wealthy and large corporations pay their fair share in taxes. As President, Sen. Sanders will stop corporations from shifting their profits and jobs overseas to avoid paying U.S. income taxes. He will create a progressive estate tax on the top 0.3 percent of Americans who inherit more than $3.5 million. He will also enact a tax on Wall Street speculators who caused millions of Americans to lose their jobs, homes, and life savings. There's a dozen more on wealth inequality at the link above and ten different topics. nothing gets past you Matt.....you know the public is just a bunch of people, don't you? and most of those people vote for people who do airstrikes are you sure you want those people to control the money system? of course if your numbers are correct the near 65% that don't bother to show up either agree with what's happening or care so little they can't be bothered to make a choice. Stop being determinedly dumb - there are plenty of articles and videos that have been posted to this forum. Check em out - and see if you can get a little education for your self. Because currently - your position - is to say the LEAST - ignorant. And I have got to believe that it is intentional on your part! does he favor anything you favor ? Then tell me what you have a problem with - you will even have a reference that you can copy and paste from to express fully - that which you find problematical. "we need to focus more heavily on diplomatic alternatives to war." Are you tripping mat? Is that why you "had" to leave the Navy? Did you receive permanent brain damage while you served in the Navy? Are you receiving adequate care through the VA? I ask - because - seriously mat - many of your comments are floating way out there in the damaged ozone layer - and many float totally in outer space. "Iraq had no weapons of mass destruction "
Do you know the last time we weren't at war or dropping bombs? OK - well you should get those other issues of yours looked at by proper medical services. Both Hans Blix and Scott Ritter working for the U.N. pushed the case for no Iraq War hard. They knew better because they were doing the weapons inspections in Iraq. However, there was bad blood between Saddam Hussein and the Bush family. For many years, Saddam mocked George H.W. Bush as a one-term loser President in spite of winning the First Gulf War in 1991 and even tried assassinating H.W. W. Bush took advantage of 9/11/2001 attack as a pretext for war. Saddam did create the impression that he was creating WMDs by the cat-and-mouse game he was playing with the U.N. weapons inspectors so one could say that he was begging for an attack. He hanged around his power while mocking H.W. having been fired by the 1992 U.S. election so Saddam eventually realized his superiority to democracy by getting hanged on a noose by his own people. Give Matt a break, will you? How can the U.S. stop the airstrikes (and still accomplish its objectives)? I can imagine how the foreign populations must have viewed U.S. occupation forces, not to mention the drones flying above dropping bombs. I got more than enough of U.S. fools driving humongous black humvees blaring 110dB horns flying the U.S. flag. Baghdad's Green Zone convoys may very well have been spearheaded by fools like these. How can the U.S. stop the airstrikes (and still accomplish its objectives)? You better believe they are getting jitters, look at all those people hording right back to the Democrats after 8 years of slobbering to Wall St, nonstop war and banker theft. Basically 08 all over again. what's the matter turbo, too many facts? When did they make Sanders King? Remember your part, you allow the airstrikes when you allowed W Bush to win which led to the Iraq war which led to the airstrikes, so remember you allow the airstrikes. You could question the action of the DOD - instead you just sit here and piss and moan.